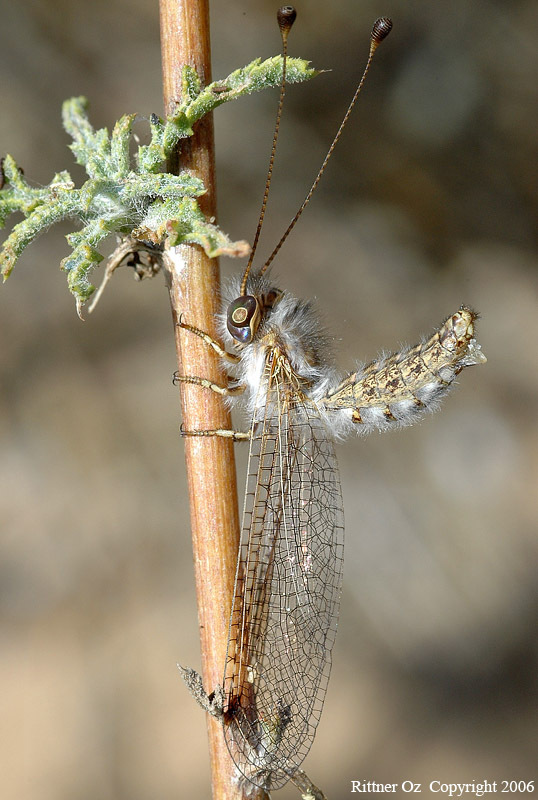 Delicate Neuroptera specie. length 15-20mm. distributed in most parts of Israel. The larva is covered with sand and prey on small insects. later on puptae in a silk cocoon. shot was taken in sands area near the mediteranean sea. What an interesting pose of that drgonfly, Oz. The details are superb, and the exposure is perfect. Great POV. Amazing "fuzzy" looking body. The light on the wings is fantastic. An excellent capture of this amazing insect. Good lighting,great DOF and sharp clear detail. Excellent capture of this interesting insect. What a pair of drumstick it has!!! The pose is very beautiful and the details perfect. I only missed a better note to know more about it. Great mpicture of this Neuroptera species. amazing shot, the sharpenss and details are incredible. Unusual pose and great POV. DOF, colors and composition are lovely. I have never seen such a funny insect with my own eyes, must be very amazing. What a pose it has! Very good POV and BG! Deserves more then 2 points! Keep on going and TFS! beautiful photo,I like the sharpness of its wings.Very good light.